I have been trying to keep up with the Spring fashion shows, but there are so many! However, the ones I have seen, I find a ton of inspiration. 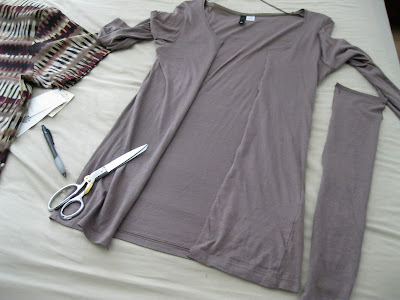 I have even found a few looks that I know I can recreate :) The following DIY comes from a look in the Burberry Prorsum Spring RTW 2012 collection. 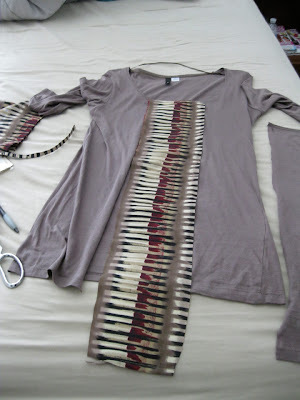 I have a feeling I will be doing quite a few more runway inspired DIY's in the near future! 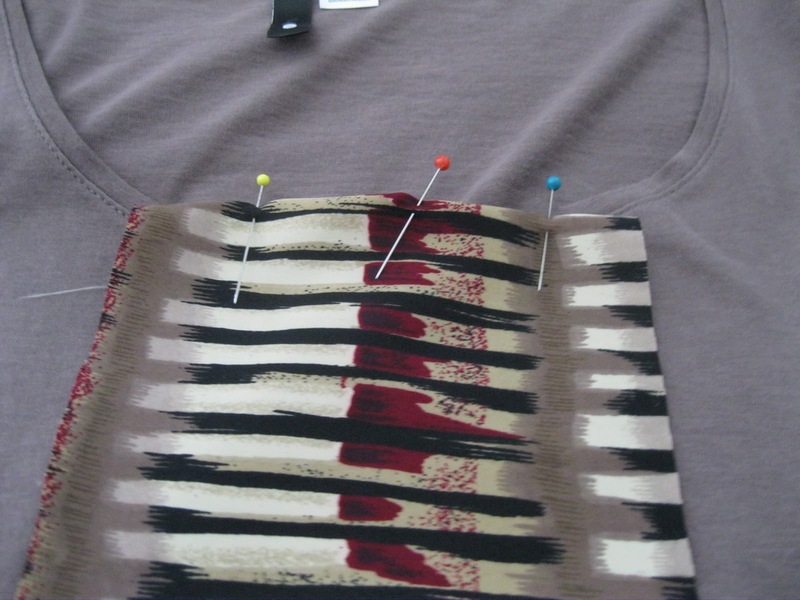 I found this shirt and I really liked the pattern, however it is a 2X... so I figured I could at least cut it up and use the fabric for my center panel. 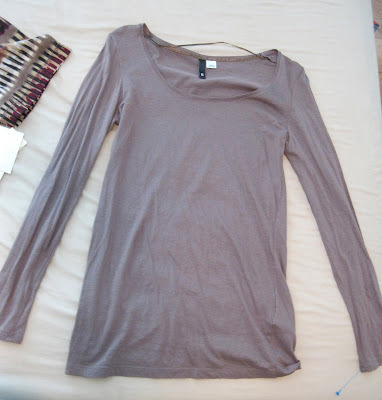 I found this mocha brown long sleeve that goes perfectly with the pattern shown above. I only paid $6 for this one and $5 for the short sleeve. I figured for $11, I could experiment a bit. I began the process by putting on the long sleeve and seeing where the center fell on me. I then made two ink marks as big as I wanted the middle panel to be. I ended up measuring 4" and making pen marks all the way down so when I cut it, it would be straight. I cut out the center panel, as you can see above. Note, this is my first time using Jersey knit and it is a pain in the Ba-donk-a-donk!! I suggest using a different fabric if you're a beginner like me. I then cut a strip of fabric from the patterned blouse. I cut it 5" wide to compensate for the space it takes to sew new seams. 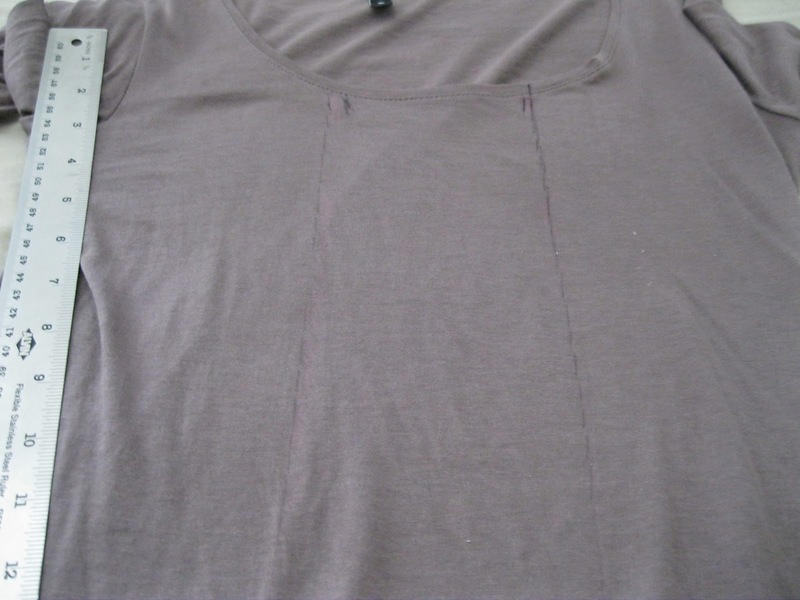 I lined up the panel to the collar and the bottom of the long sleeve in order to see where I needed to hem the it. Once I made sure the two pieces fit I folded and pinned the panel and proceeded to sew it on top and bottom. 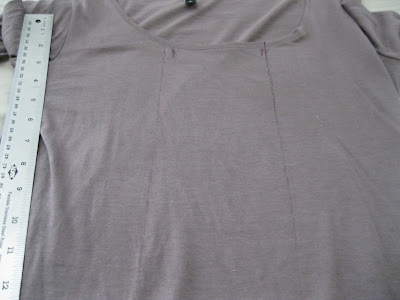 After I made sure the top and bottom of the panel were hemmed, I began pinning the sides to the long sleeve. Again, working with a knit can be kind of trying but I got through it with only minimal puckering!! My little afternoon project only cost me $11 and two hours time!! 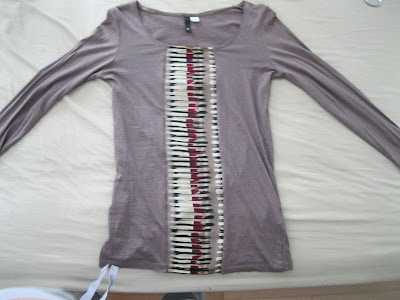 I promise a style post with this shirt very soon!! So cute! Great job on the shirt! This is beyond amazing!!! I love how you created the runway look!!! Great idea - love the creativity! Good tip for those of us on a budget! 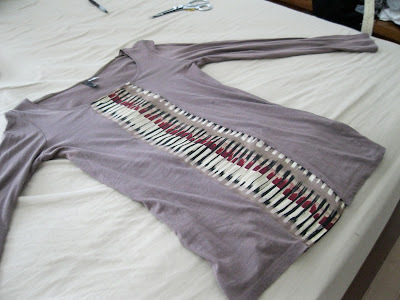 Very stylish DIY, love it!